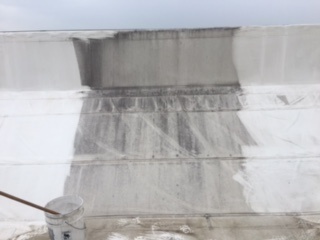 The La Quinta Inn and Suits Duro-Last roof has performed well over the past 7 years but it's close proximity to I-65 means that car and truck exhaust along with other outdoor pollutants had left a dirty film over the PVC membrane. The hotels owner didn't like the way the parapet walls showed the dirt and grim as he drove past his hotel. 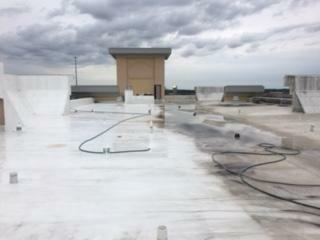 So the maintenance supervisor at La Quinta reached out to Exterior Pro Roofing for recommendations on how to clean the Duro-Last roof and make minor repairs from one leak in the roof. 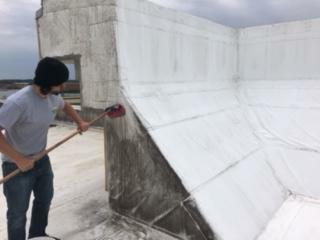 Duro-Last is a very easy to clean roofing membrane using mild cleaning solution like Simple Green and soft bristle brush. 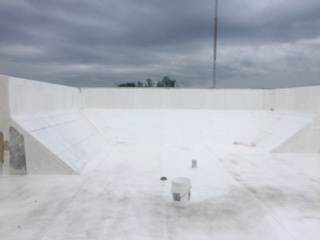 It took just one day for a hard working crew of 5 from Exterior Pro Roofing to remove the dirt and grim from the membrane and make it white again. 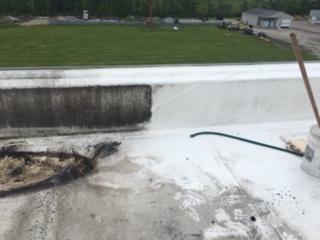 After the roof was clean it made finding and fixing the one leak easy. 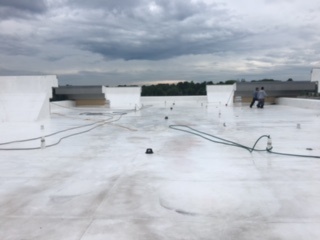 Two guys were able to find the leak, replace the damaged wood, and roof insulation, and patch in the Duro-Last Roof membrane. One great quality of Duro-Last membranes is that it retains its ability to weld. A hot air weld is how the seams are made joining the piece of the membrane. Duro-Last membranes stay weldable throughout their life span making them very easy to repair. 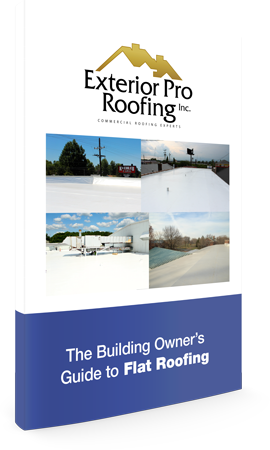 Exterior Pro Roofing is a Master Elite Duro-Last installer serving the Columbus Indiana area.